Well, just when I think I've shown you all my Christmas projects, I find another one hiding that I haven't showcased yet. And this I think is one of my favourites of this year. Once again it is a concertina card, although this time with a lot less panels. I have cut the letters from Gold/Silver Glimmer paper and used the Year of Cheer papers to mount them on. They were then mounted on Gold/Silver Foil card. The holly leaves were punched from Wild Wasabi card stock using the Holly Berry Builder punch and the berries from Real Red card stock using 1/8" circle handheld punch. 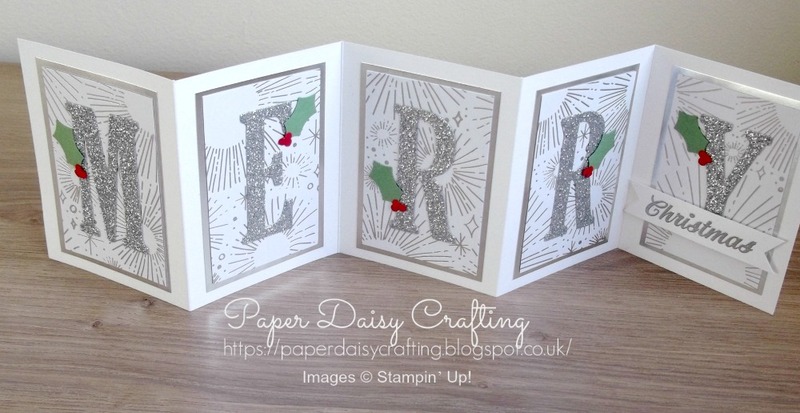 The "Christmas" sentiment I used was from the Merry Mistletoe set - I had to mask off the "Wishes" at the bottom (see how in the video below) and then heat embossed it in either silver or gold. If you'd like to see my video tutorial showing how I made these cards, just click HERE or on the image below. Whisper White - 28 cm x 9 cm scored at 7 cm, 14 cm, 21 cm. And 8 cm x 9 cm scored on the 8 cm side at 1 cm. Whisper White - 211 ins x 3 1/2 ins scored at 2 3/4 ins, 5 1/2 ins,8 1/4 ins. And 3 1/4 ins x 3.1/2 ins scored on the 3 1/4 ins side at 1/2 in. Now, that really must be the end of Christmas cards for me. Can't wait to get started on projects using all the new goodies from the Spring/Summer catalogue. Would you like to receive one FREE from me - just let me know and I'll pop it in the post!